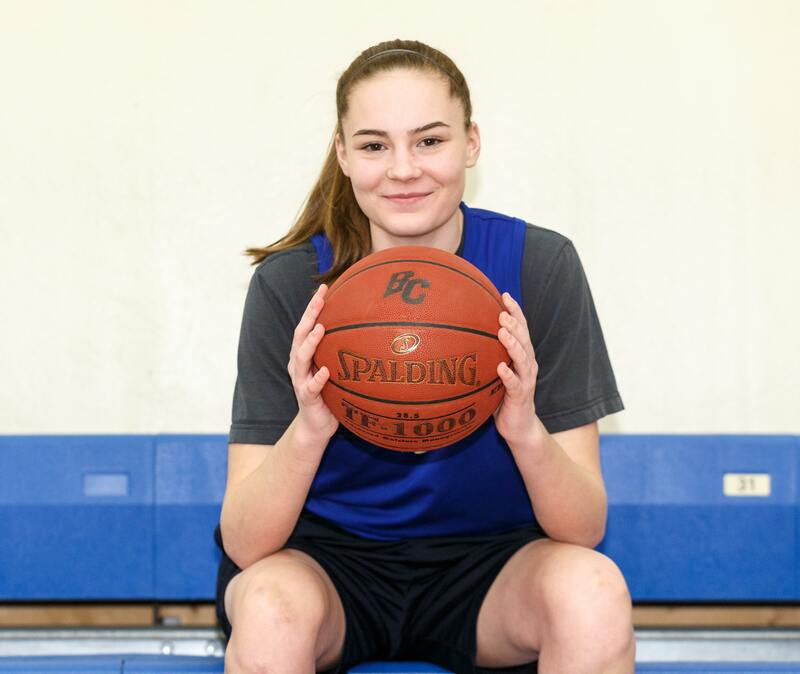 When the Brookfield Central girls basketball team lost senior captain Claire Haynes, a returning first-team all-Greater Metro Conference player, to a back injury in the second game of the season, the Lady Lancers needed someone to step up. 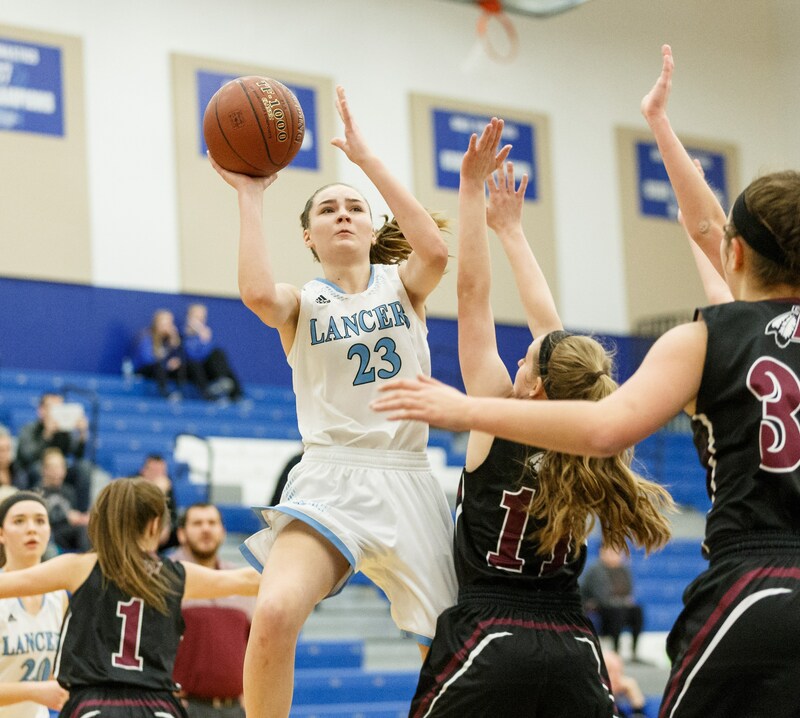 Between losing a star player and the emotional toll it took on the players, the Lady Lancers dropped 5 of their next 6 games to give them a 2-5 record to start the season. With team's starting to double team Central's star guard Caroline Busch, Coach Mallory Liebl needed someone to step up big time. Surprisingly, she turned to a freshman on this senior-dominated team to step forward. But then, Anna Mortag isn't your typical freshman. So Liebl figured it was time to sit down with Anna and have a heart-to-heart talk. "It's hard to come into any program and for one, to be the only freshman, on a varsity team," Liebl said. "Especially with seven seniors, we're very senior-dominated. Our team is filled with really strong personalities in a good way. "With Anna, I knew she could do more than what she was doing. She was kind of holding back a little bit because she wanted to be respectful of the older girls on the team and the other returnees. But we needed her to play up to her potential if we wanted to be successful." Mortag remembers that meeting well. "Coach told me I know you do what you can, but you could do a lot more." Anna recalled. "It kind of put a little more confidence in me. I was thinking I could do those things. I felt pressure, but it was kind of good pressure." Since that 2-5 start, the Lady Lancers went 14-3 to go into the sectionals with a 16-8 record. And Mortag did her part. She is second to Busch in scoring (11.5 points per game ), rebounding (6.2 rebounds per game), field goals made (109) and attempted (235), free throws made (41) and attempted (70). She also tops the team with 37 blocked shots and a .464 shooting percentage and is third on the team in 3-pointers. Liebl has been more than pleased with Anna's development and contribution. "She's definitely gotten better and more comfortable as the year has gone on," she said. "From the beginning of the season until now, she's more confident. She kind of knows how we play now, how I coach. It's really exciting to think about how much she's improved just in these last few months." Anna gives a lot of the credit for the way she was accepted by the squad. "Coming into this year I was shy and stuff," she said. "They were really nice. We're like sisters now. I really don't want this season to be over." Bill Mortag, Anna's father, emphasized how wonderful it was the way the team accepted his daughter. "She was very lucky, very fortunate that the juniors and seniors she plays with are really great girls," he said. "And Rob and Ellen Busch (Caroline's parent) have been awesome." Anna is a 6-foot forward who has a well-rounded game. She can handle the ball, she is a solid shooter from the floor, an excellent shot-blocker and has a quick, first-step move to the baseline as good as any player I have seen this season. "I enjoy going to the hoop because of my height," she said. "And blocking shots. I like blocking shots. It's just funny. I know my teammates like it." Mortag then talked about what she needs to work on. "When I'm playing good I enjoy defense, but sometimes it's just hard," she said. "I have to work on getting back on defense and being low and guarding my girl." She also knows she wants to improve her ballhandling and shooting. "Sometimes it's on, but it's really inconsistent, so it probably needs work," she said. Liebl knows she is dangerous with the ball in her hand as well as her work in the paint. "Her strengths are definitely scoring the basketball," she said. "Being able to score the ball near the basket. Obviously her ability to block shots and protect the basket is also big." But being a freshman, her game can only get better. "She has potential for really every part of her game to get better," Liebl said. "I think it's really important for people to remember that she is only a freshman - even though she doesn't play like a freshman. "She's just going to get better at everything. One of her biggest things is she can get a little bit tougher. But again, that's just being part of a freshman. She has to work on adjusting to the style of play. But she is just going to continue to get better at everything." Mortag's success shouldn't be surprising, considering her two oldest brothers played at Brookfield Central. Seth is currently playing at St. Cloud State and Caleb is at UW-Whitewater. She also has a brother, Noah, who is a tackle on the Lancers football team. "It was kind of crazy, because growing up it was always Seth and Caleb, Seth and Caleb. It was always about them," she laughed. "But now they have a lot of expectations for me. "Every game it's like 'Anna you've got to do this.' I just want to kind of make them proud. They're good role models. They come to my games." Anna's dad, Bill, worked closely with his daughter. Anna has been into basketball since she was in the third grade. Her dad coached and she would practice against boys who were in fifth grade. That's where she first started to develop her dribbling skills. She recalled playing at the YMCA when she was 6 years old and she played for the Jr. Lancers in third grade while attending Wisconsin Hills. Anna talked about why she stuck with basketball. "Having the good drive to get better," she said. "I just like new things that I could do like dribbling the ball and doing different moves. My dad really helped me work on stuff so it was never really boring. "I worked on my dribbling with my dad. My dad doesn't want me to be a post necessarily. He taught me how to do everything. Working with the team, meeting the people, winning games." Bill had high praise for his daughter. "She has the God-given ability. She could be the best of the three," he said of his basketball-playing children. Liebl recalled when she first say Anna play. "The first year I got the job here she was in seventh grade," she said. "The first time I saw her play was at Jr. Lancer tryouts. Initially when I got the job, people were talking about her and said 'Wait until you see her play. She's going to be a really good high school player.' So I started to pay attention a little bit." It took Liebl only a few games to realize Mortag was something special. "In seventh grade, you don't expect somebody to be dominating," she said. "When I saw the way she played - even at that age - you could tell there was a lot of potential there to be a great player." Mortag and Busch helped the Lady Lancers until they put things together down the stretch this year. Busch became the Lady Lancers all-time scoring leader and needs 12 rebounds to take over the all-time top spot in rebounds. Claire Haynes returned to the lineup in late January and is almost playing like she never left. Senior Leah Swenson has become a legitimate 3-point scoring threat. Amanda Miller continues to do an excellent job running the offense and playing defense. Several other players have stepped up and contributed which help save a season that was spiraling out of control early in the year. Mortag talked about the team's adjustments. "We can depend on each other a lot more. Caroline trusts us a lot," she said. "We're working the ball, everyone's scoring. People are getting points here and there. Everyone's contributing. They're doing their best. That's a big part of it." Liebl meanwhile looks forward to having Anna Mortag around for three more years. "To think that she still has three more years to continue to improve," she said. "So from that stand point it's really exciting that she's definitely done a really good job of stepping in and helping our team kind of turn things around." FAVORITE MOVIE: Mean Girls, 16 Candles. '80's Movies. WHAT DO YOU DO TO RELAX? Watch TV or Listen to Music. MOST MEMORABLE SPORTS MOMENT: Reverse layup against Brookfield East to take lead.